Buying or selling a home is one of the most profound decisions in life. Considering there are a plethora of real estate agents, picking one you trust with one of the most important decisions and investments in your life can be a difficult process. Since there are several Realtors® to choose from, chances are you have a family member or close friend who has their real estate license. If they have the experience, qualifications, great references, and extensive expertise in the neighborhood of your choice, it may seem like a done deal. But, is it as good as it seems? While there are some positives about working with a family member or good friend, there are also several downfalls to taking this route. Why should you not use a friend or family member as your real estate agent? He or she may not have expertise in the neighborhood of your choice – Before starting your journey to buy a home, consider where you want to be located. Do you have a favorite neighborhood? Narrow your search to a few neighborhoods and try to locate a real estate agent with expertise in that area. Using a Realtor® with experience in a certain area can give you a leg up. That agent can provide you with local information, relationships with other Realtors® in the area, and great knowledge of the neighborhood’s inventory and history. There may be a disagreement about what’s best for you – You may know what you want, and that could be a two-story house outside of the city. However, occasionally friends and family members think they know better than you do. This can cause disagreement that you would not have experienced otherwise. If you want an impartial third party real estate agent, I recommend steering clear of family members and friends. He or she may put in less time or effort than other agents – While this is not true for some friend or family member real estate agents, it can happen. At times, a real estate agent who is working for a friend can present a “relaxed” attitude because they don’t believe their friend will fire them. So, try and stay away from this. Your investment is important, and your agent should treat it that way. Also, another potential problem – would you feel comfortable firing your friend or family member? Telling your friend up-front that you shouldn’t work together is a less dicey situation than firing them when something goes awry. He or she may not be upfront and honest with you – Honesty is the best policy. This applies to any and every situation, including real estate. As homeowners, we tend to think our house is worth more than it is. It often takes a Realtor® and an extensive market analysis to show sellers what their home may sell for in today’s market. A friend or family member may shy away from telling you that you have listed your home for more than its worth. This will cause your home to be on the market longer and will make the process more stressful. The stressful process of house hunting or selling can create tension in a friendship – but it’s something that’s avoidable. If you have to fire your friend, it could cause the end of the friendship. Are you willing to lose your friend through this process? Chances are, you aren’t! So, try to stay away from this and hire an impartial agent. Qualifications, experience and expertise are the clear winners for choosing a real estate agent to represent you. You have to find someone you can trust and someone that has your best interests at heart. Shopping around for a real estate agent can be the most important process in your real estate journey. Below is a list of questions to help you locate the perfect Realtor®. You’ll be happy to have taken the time to find the perfect Realtor® at the beginning of the process rather than three or four months down the road! 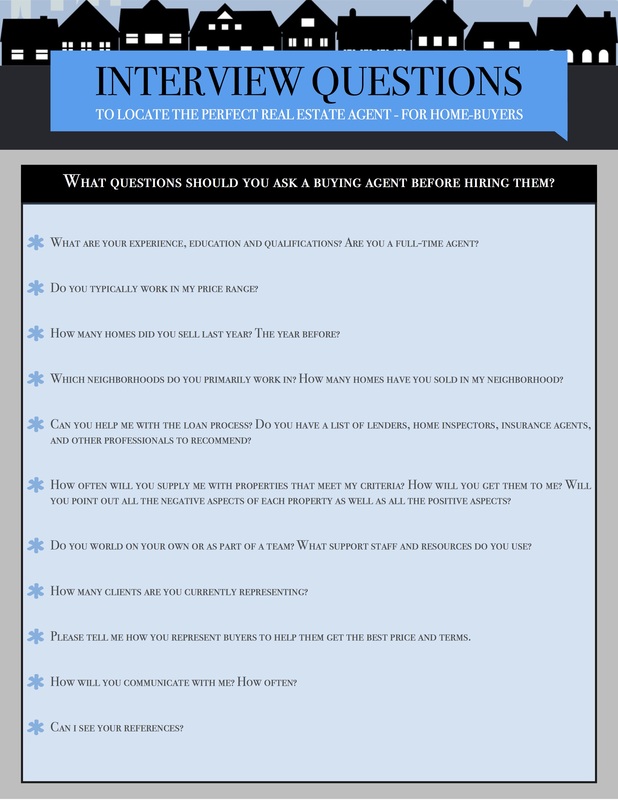 Do you have any questions about choosing the perfect real estate agent for you? I am always here for you and welcome any questions you may have.